What’s Involved in Learning to Count? Joey loves numbers. He gives me big smiles when he sees that we are going to work with numbers, and loves to tell silly number jokes where he gives me the wrong number when we are putting our numbers in order. After giving me the wrong number he will crack up, and give me that large Joey grin that says “I think 1, 2, 6” is the funniest thing ever. 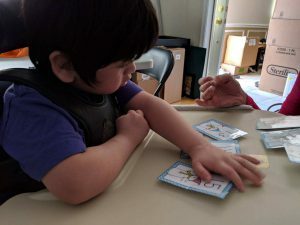 Yet recently in my work with Joey I realized that although he can give us the numbers in sequential order, and can match the numeric word with the numeral (which is something not all kindergarteners can do), he has difficulty counting a set of numbers. How am I just now discovering this? I wondered. How is this possible? Yet once I sat back and noticed how I worked with number with Joey, I always did the majority of the counting – I touched the items and counted aloud, pausing before the last item to say “Now how many?” Joey was almost always correct in these situations – because he was able to identify the numeral that came next in the series. He was not counting the objects with one to one correspondence. When I give Joey a set of objects or pictures between 3 and 6, and I say “how many are there?” he has difficulty counting each object and then telling me exactly how many there are. Why is this? 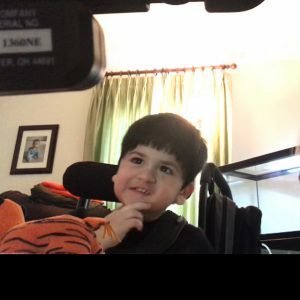 With everything else we know about Joey – his ability to remember sequences, make predictions, tell jokes, and identify numerals and letters – it seems odd that he would have difficulty looking at three objects and telling me there were three. This difficulty makes me stop and think about what skills are needed in order to count sets of objects. Typically, we don’t think about it, but when we learn to count independently, we are using our visual motor integration and processing. In order to count each object, we need to see that there is only one of each object, and typically, kids touch each object as they count. As they touch each item they know there is only one of each item, as they match the feeling of the item with their vision of the item. As they count they can say each number, matching the verbal cue, the item itself, and what they see. For Joey, counting sets of objects is a bit more difficult. 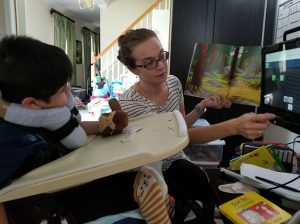 Looking at an item to touch it is a difficult task – he has to concentrate to move his hand to an item, and hold his arm still in order to touch the item. This itself takes a significant amount of cognitive energy. Then we are asking him to hold each item he counts in his mind with the numeral, and to move on to the next item. We are also assuming that Joey can see each item, and only one of each item. This requires Joey’s head to remain stable so he can clearly see the item in front of him, and for his eyes to easily track each item, and not go back to an item thinking it’s one he hasn’t seen before. Are his eyes converging? Is he seeing double? Or is he simply having difficulty coordinating everything he needs to put together in order to count? Or, is he being stubborn, and refusing to give me the correct answer, as he sometimes does when he decides we are wasting his time? 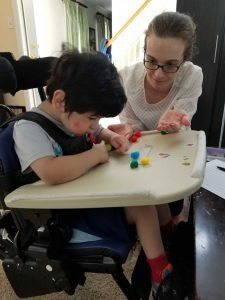 For now, I need to be re-thinking how we learn to count with one to one correspondence, the different components necessarily to count groups of items, and Joey’s strengths and limitations. How can we use his strengths to help him take in sets of objects in order to count? Should we re-think how we measure Joey’s ability to count? Instead of using objects, can we use sounds or physical touch? How do we transition from counting sounds to counting objects we are not sure what Joey’s visual processing is doing? “Turkey ready pool love” Joey said as we read Red Hat, Blue Hat by Sandra Boynton. Sure enough, on the next page, the turkey was getting fully dressed to jump into the pool. Joey giggled and held a small stuffed turkey in the air. “Up!” he said, grinning. “Up”. In early August I was able to attend the Inclusive Schools Summer Leadership Institute in Syracuse, NY. It was an emerging, thought-provoking conference. One of the handouts in our folder was this list of Strategies for Presuming Competence As I read through it I immediately thought of Joey, and how these strategies support the work we do with him, and in turn, allows him to rise academically, socially, and developmentally. I was struck by the idea of the need to look for competency and evidence of understanding. 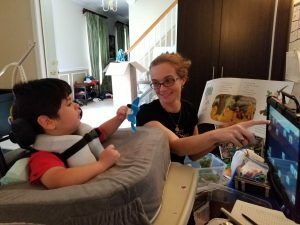 For children like Joey, it is easy to run through lessons or schedules without taking time to look for evidence of understanding. We wait for the student to meet one set expectation, but don’t always look for other ways a student may show her understanding.